I did something very out of the ordinary for me. I made a recipe as-is. Didn’t screw around with it at all. 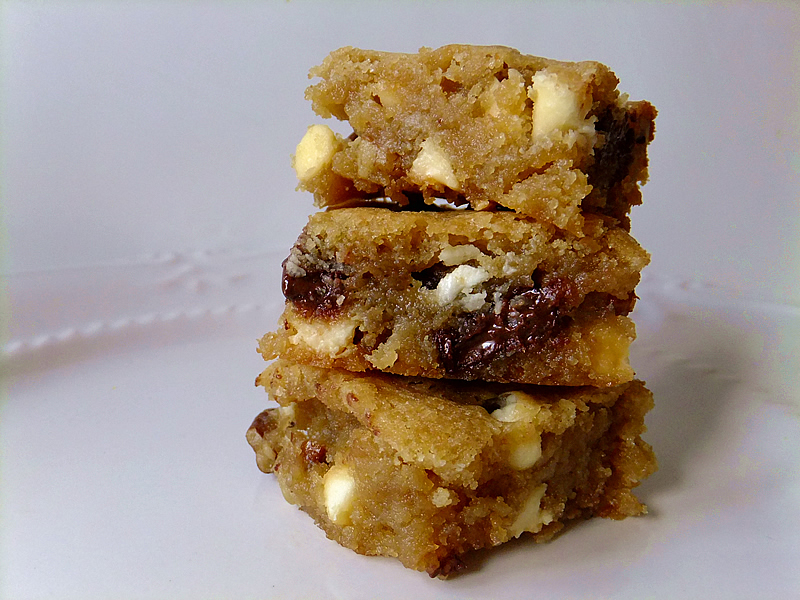 What makes this especially remarkable is that the recipe was for a decadent chocolate chip cookie bar calling for an entire stick of butter! I’m always trying to improve the nutritional value of desserts. Usually I cut back on the sugar, use agave nectar, substitute whole wheat flour, replace half the fat with fruit puree, et cetera. My kids like to call this “taking the fun out of everything”. However, this recipe was so simple that I didn’t want to complicate it. Calling for just flour, sugar, butter, egg, and chocolate chips, it came together in mere minutes. The best part of it’s simplicity is that there is only one bowl to lick wash when you are done. These are so incredibly easy to make you can even do it with a hangover. Trust me. Preheat oven to 350 degrees F and grease an 8×8 pan. Add brown sugar to the butter and beat until smooth. Beat in the egg and vanilla. Stir in the flour and whatever chips and nuts you decide to use. Bake for about 30 minutes or until edges begin to brown. Cool before cutting (ha ha, not very likely). Mouthwatering! I think they look absolutely delicious! I love the colours inside of it, especially the mixed chocolate chips. Hopefully I’ll get to make this one soon! Do it, Jeff! They are ridiculously easy. These look amazing! I, too will be making these soon. Thank you for sharing! Allen. 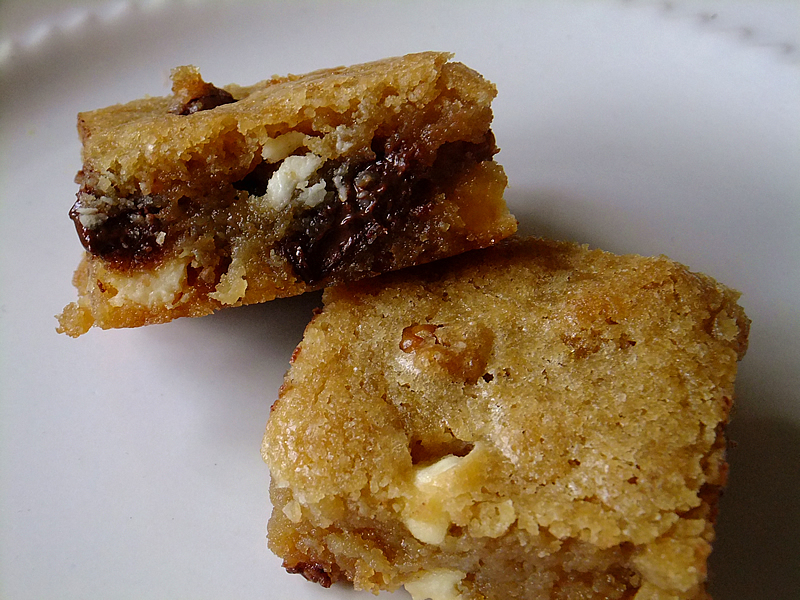 These look great, I agree with Choc Chip, warmed up, with ice cream – HEAVEN! Yes! And caramel sauce. Now we’re talkin’! Green Smoothie… the new Shamrock Shake!